The Holy Spirit that now lives inside of born again believer/Christians… has changed the way we worship of God. Having to worshiping Him in a temple and doing rituals and sacrifices is a thing of the past. We can now worship God in a very personal and much more direct way….in spirit and in truth. 1. Worshipping God from the inside out. 2. Worshipping from deep inside of our soul, spirit man and heart. 3. Worship is what you believe about who God is. 4. Worship is everything you do and are in your relationship to God. 5. Worship is your commitment and surrendered total self… to God. 6. Worship is you putting God first before anything in your life. 7. Worshipping God is… loving God so much that your life is so full of Him that you shine enough for others to see Jesus in you. In order to worship God like this… it must be done in the spirit. Why? Because God is a spirit being and the way that He communicates with people is through His spirit. Even before you became a Christian…the Holy Spirit was speaking to your mind and heart trying to woo you to God. Then when you repented of your sins and believed in Jesus the Holy Spirit came right inside of you/your body and your ability to communicate directly to God was made complete. Your spirit and Gods spirit connected supernaturally. Without the Holy Spirit this incredible connection would not be possible because humans cannot connect with God because He is a spirit being and we are mortal/flesh. We must worship God in truth. 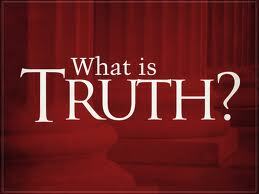 What is Gods truth? John 17:17 Sanctify them by the truth; your word is truth. It’s wise to worship God when you are clean inside. The only way to be clean is if you know the bible/Gods word…because His word will make you clean inside. It’s sharp and can slice you, dice you and shave off anything that is not right or true in your life. Then you will be in a great place with our God and you’ll be a vessel that can come before a Holy God and present yourself to Him and be fit for the master’s use. In this way you are worshiping Him with all that you are in Him. 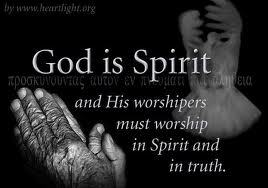 This is why it takes these two things…spirit and truth to worship God. They go hand in hand. This is how one worships our Almighty God. If anyone tells you anything different other than John 4:23-24 on how to worship the Lord… it’s not the truth and you should not follow that teaching. Do what the BIBLE tells you to do pertaining to anything about God. This is the truth of God and EVERYTHING else is…FALSE! God’s word is true. True = life…false = death. 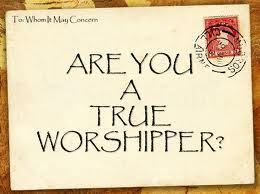 Are there any true worshippers in the house? Your very life is worship to God. Listen to the Holy Spirit living inside of you He will lead you to the truth. Message for today: Follow the truth of Gods word and you will be in the best place possible with God…you’ll be a…TRUE WORSHIPPER!!!!!!!!!!! Study the bible in depth. God bless you! Excellent post, Tanya. I agree with all the comments also. I also pray for the blinders/veil to be removed from people’s eyes. If they knew the truth, they wouldn’t just go about their daily lives living for themselves and ignoring God’s love for them. The spirit convicts us of the truth and the truth can only be found in the Spirit. Our flesh does not know how to worship in truth. That is why the Lord seeks worship from those who will worship Him in Spirit and in Truth. Worship isn’t a mere song, it is a heart submitted to the Word of God and living in it by Faith. Those moved by the flesh are moved by hype and sounds…but those moved by the Spirit, seek the honest and true things of God and worship Him in that way. I know that you are a True worshiper. Hey nightshade130! very good words….you got that right! Amen Sherline…well put. Yup… I’m a true worshipper alright! I am a true worshipper 4 sure…you too! Oh I love this! I pray for the blinders or the veil to be removed from people to see the truth! Cathy…this is my prayer everday. I pray for soul to know our King!! If they only knew…the truth!!!!! Yes, Tanya I am convinced the enemy has blinded so many to the truth. People don’t understand the truth. If they did we wouldn’t be wasting our time on so many issues that weren’t even thought of 30 years ago!